It is rare for me to mourn the dominance of the written word, but the fact that it has overtaken its spoken equivalent with regard to phones, as Linda Grant points out in her excellent article, upsets me somehow. No one enjoys the PDETR (Public Display of Emotional Telephone Ranting), of course, nor overhearing pointless telephone calls of the ‘I’m on the train’ variety, but there is something sinister to me about the phone being used for everything apart from its original purpose: talking. Earlier in the year, I wrote a paean to my IPhone, & it is smartphones in general, with their countless apps, which Grant implies are to blame for the decline in telephone conversation. We are simply too busy emailing, Twittering or blogging that it is our fingers, rather than our lips, which we prefer to move nowadays. My phone, like Grant’s, rings rarely nowadays: friends prefer to tweet or text, & I am the same. My reasons, however, are perhaps different from theirs. (Certainly, there is something to be said for the opportunities to procrastinate which texts and emails allow, whereas the telephone call, like a toddler demands your attention immediately.). I rather enjoy, and have enjoyed always, the sound of silence: whereas my best friend enjoys the television as background noise, I would only have it on twice a week if possible. According to a 2011 Ofcom article, 1 in 7 houses are landline free now, and I can count myself as part of the literally rootless generation. But think on this: some of the world’s most stunning art would not have existed without it. 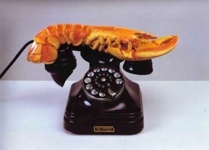 Sylvia Plath’s ‘Words heard by accident, over the phone’ would not have been written had the landline been extinct in the 1960s, and Salvador Dali’s Lobster Telephone would have looked rather different had it had a Blackberry at the centre of its design. I will not miss the landline: I would only buy one myself as decoration (this retro Wild & Wolf design is particularly lovely), but it certainly seems that the more forms of communication in which we indulge, the less qualified we become to actually talk to each other.